Today is National Agriculture Day. the one day of the year when Congress encourages everyone to stop and think about agriculture. We are thinking about all the people involved in agriculture and all of the things they are accomplishing! Farmers who are producing food for their families and a few neighbors as well as the farmers whose crops are sold on the larger market. The many people who work in co-ops and farm supply stores, providing important services and products for farmers regardless of the production practices employed. Employees at grain elevators, cotton gins, distribution centers, barges, trucking companies and more are ensuring grain, fiber, fruits and vegetables continue to move through the system. People are buying and selling products to fill the shelves at the local market or to deliver critical food aid to a country in crisis. What is their day like? And what are they thinking about as they observe National Ag Day? Read the following blog posts to find out! Planting Knowledge in Others – Illinois State University Student, Steven Beisswenger, discusses the technology and management that goes into conservation work for corn farmers across the country. Food Ethics – Liz from the Wyoming Stock Growers Association takes a look at the progress Agriculture has made in food production since the 1950s and the conservation work they’re doing to feed a growing population in the future. Relish the Food Choices Available – Katie Pinke of North Dakota emphasizes her appreciation on food choices instead of food guilt when it comes to choosing food for her family. The Farmer, Ag Week Special – Kathy Hasekamp of Missouri shares what she’s learned while farming with her husband raising cattle, hay, corn, soybeans, and wheat. Teaching Our Grandchildren – Wanda Patsche of Minnesota is proud an honored to share the experience of raising hogs, corn, and soybeans with her grandchildren. City Girl Meets Ranch Life – Briána Belko was a city girl with a Liberal Arts degree when she decided to work on a family member’s calf ranch in California. Now she’s sharing her passion for agriculture through her urban roots. Slow Money Farm – Jan Hoadley, an Alabama farmer, recognizes that we seek out the experts in many life situations, why not look to farmers when it comes to food? Shouldn’t We Have Parades – Suzie Wilde, wife of a Texas cotton farmer, is looking for a little fanfare to be tossed the way of farmer for Ag Day. My Other, More Exciting Self – Lara Durben utilizes her experience working with Minnesota poultry farmers to shed some light on the truths of raising food. Pride, Humility, Courage and the Long Haul – Beyond the Rows provides some perspective on farmers and the way they approach their days at work. From One Generation to the Next: National Ag Day – North Dakota rancher Val Wagner says “Generations Nourishing Generations” is almost our farm’s motto – and as we raise the next generation, we strive to ensure that we’ve done our best for the future. My Plans for National Ag Day – Janice Person talks about the typical day in agriculture for her as she works in agricultural communications in St. Louis. The Daily Cowman is Ag Proud – Larry Olberding, a Washington cattleman, takes time to spell out why he is agriculture proud and gives thanks to those who have contributed to his journey. An Ag Day Poem: A Day in the Life of My Farmer — Iowa farmwife Val Plagge wrote a poem for ag day talking about some of the things her husband is doing as they raise corn, beans, pigs and kids. Be sure to catch some great interaction online with farmers, ranchers, and the agriculture community throughout the week. On Twitter follow the hashtags #FoodD and #AgDay. Tune in tonight at 8 p.m. Eastern as the AgChat Foundation hosts an Ag Day party. Follow on Facebook through this event page or join in on Twitter by following the #FoodChat stream. Go. 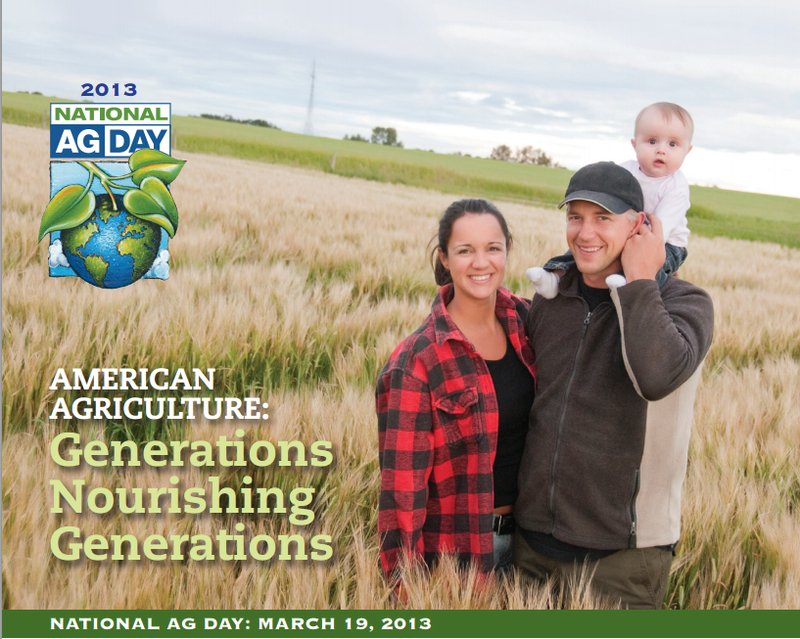 Celebrate National Agriculture Day! Have you thanked a farmer?